The Dew-Schmitz Duo comprises Cathryn Dew, recorders and Micaela Schmitz, harpsichord. 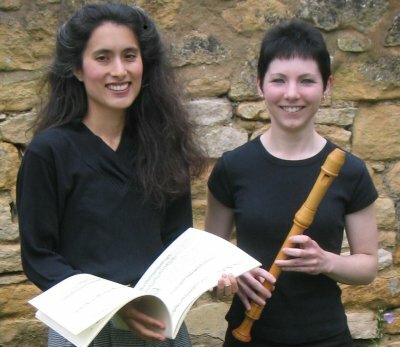 Cathryn and Micaela have performed early music (anything up to Bach) together since 2004 and bring together their considerable experience of working with young people and interacting with audiences of all ages. They are sometimes joined by Andrew Watts, when his busy schedule permits! To hear audio samples click the following links. Each will fade out partly through a movement. Before the ‘internet café’ there was the coffee house. In the 18th century they were sometimes called ‘penny universities’ because it cost a penny to get in and drink all the coffee you wanted, People often met to discuss events, politics and issues of the day. Step in to our coffee house where you can enjoy coffee, goodies, and a delightful interactive experience of our very own, musical penny university. Our special guest is Telemann, who used to jam at Zimmerman’s coffee house with Bach and his sons...Programme includes Telemann sonatas for recorder and continuo, solo fantasies for keyboard, and more. Tudor… Renaissance… Shakespeare says it all: songs, music and a chance for the ‘audience’ to join us in dances that Queen Elizabeth would have enjoyed. We know we’ll enjoy ‘Upon a summers Day’ even if it’s cold outside! Absolutely no experience is needed to take part or listen, except for a love of all things Shakespeare! A whirlwind tour through the continent and a bit of England in the 17th and 18th Centuries. Take a journey in the comfort of your chair and tap your feet to some inspiring court, table and dance music, from the blind composer van Eyck to the toe-tapping Italian Ground, from the lush strains of d’Anglebert to the spirited Division Flute, there’s something for every taste. "A musical tour de force"
Cathryn Dew (recorder) and Micaela Schmitz (harpsichord) took their audience on a musical tour of Europe in the Baroque era in this concert. Their command of their instruments was impressive as was their ability to talk so eloquently about the music, the composers and the instruments. The first half consisted of short pieces from the 16th and 17th centuries by relatively unknown composers most of whom would have been working in churches with organists whose instruments were tuned differently from each other and from today’s equal temperament keyboards. Both performers played a solo piece. Cathryn’s recorder solo was a magnificent rendition of a piece by Jan Van Eyck which sounded as if more than one instrument was involved; Micaela’s solo was a beautiful and sensitively played Prelude by Jean Henri D’Anglebert. The children and adults who had participated in the morning’s workshop many of whom hadn’t played a recorder for years were helped by Cathryn and Micaela to perform Variations on Greensleeves which was much appreciated by the audience. After the interval the works were by more well known composers such as Handel, Telemann and Vivaldi and illustrated the development of the sonata form into what we know today. All the music was beautifully and sensitively performed with Cathryn using a range of recorders including a very tiny instrument with a sparkling sound with which she played the Vivaldi. The workshop participants played another short piece and ably demonstrated the success of audience participation in a classical concert. Cathryn and Micaela are to be congratulated on providing a fascinating day of superb music.